Al Qaeda has released an audio message from Ayman al Zawahiri in which he pledges allegiance to the newly appointed emir of the Taliban, Mullah Akhtar Mohammad Mansour. 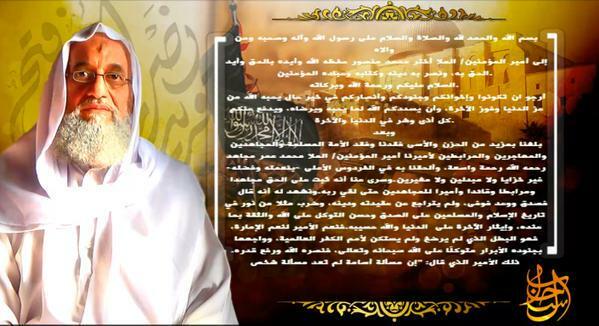 Although the speech was released earlier today, it is dated August 1, meaning that Zawahiri recorded it just two days after the Taliban confirmed Mullah Omar’s death on July 30. Zawahiri describes Mansour as the “Emir of the Faithful,” an honorific usually reserved for the head of an Islamic caliphate. Zawahiri says that by swearing bayat (an oath of allegiance) to Mansour he is continuing in the path of Osama bin Laden and all of the “good martyrs.” Zawahiri counts Abu Musab al Zarqawi, the founder of al Qaeda in Iraq (AQI), and Zarqawi’s successor, Abu Hamza al Muhajir, as among these “martyrs.” Zarqawi was killed in 2006 and Muhajir, who established the Islamic State of Iraq (ISI), perished in 2010. Zawahiri’s decision to mention Zarqawi and Muhajir right after bin Laden is part of his implicit critique of the Islamic State, which evolved out of AQI and the ISI. Abu Bakr al Baghdadi, the current leader of the Islamic State, has not remained loyal to the al Qaeda-Taliban axis. Instead, Baghdadi has proclaimed himself to be the “Emir of the Faithful” and demanded that all other jihadists, including those fighting for al Qaeda and the Taliban, follow him. Al Qaeda, of course, has rejected Baghdadi’s power grab. “I, as the Emir of [al Qaeda], present to you our pledge of allegiance, renewing the method of Sheikh Osama and his brothers the pure martyrs, in their pledge to the Emir of the Believers Mullah Muhammad Omar Mujahid, may Allah have mercy on them Allah, in pledging allegiance to you on the Book of Allah and the Sunnah of His Messenger, Allah’s peace and blessings be upon him, and on the traditions of the rightly-guided caliphs, may Allah approve of them,” Zawahiri says, according to a translation by the SITE Intelligence Group. The newly released audio message contains other implicit criticisms of the Islamic State as well. According to SITE, the al Qaeda master says that he pledges allegiance to Mansour “to establish the Islamic Caliphate that rises on the selection of the Muslims and their approval, and spreads justice and consultation, and achieves security, removes injustice, restores rights, and raises the banner of jihad.” One of al Qaeda’s key ideological critiques of Baghdadi is that his supposed ascension to the rank of a caliph was not approved by other recognized jihadist authorities. Therefore, Zawahiri’s message is sweeping. While he does not declare the Taliban’s new leader to be the head of a caliphate, Zawahiri positions Mansour and his followers as an alternative to Abu Bakr al Baghdadi’s Islamic State. This is consistent with al Qaeda’s messaging since the rivalry with Baghdadi’s men first boiled over last year. On July 13, 2014, al Qaeda released a video clip recorded in mid-2001 of Osama bin Laden explaining his bayat to Mullah Omar. Bin Laden explained that he had sworn “the great pledge of allegiance, which is mentioned in the chapters of the Koran and the stories of the Sunnah,” to Omar. Bin Laden called on all other Muslims to do the same. A clip of bin Laden’s explanation from 2001 is also included at the beginning of Zawahiri’s new message. A screen shot can be seen above and to the right. On July 20, 2014, al Qaeda followed up its release of the archival footage of bin Laden by reaffirming its allegiance to Mullah Omar in a news bulletin (“Al Nafir,” or call to arms) published online. “The first edition begins by renewing the pledge of allegiance to [the] Emir of the Believers Mullah Muhammad Omar Mujahid, may Allah preserve him, and confirming that al Qaeda and its branches everywhere are soldiers among his soldiers,” the newsletter read. Although Zawahiri doesn’t mention it, the alleged details of Mullah Omar’s death created liabilities for al Qaeda. According to some accounts, including the version given by the Afghan government, Omar died in April 2013. If true, then this means that al Qaeda was reaffirming its allegiance to a corpse in the summer of 2014. Zawahiri does not address this thorny issue. Instead, he portrays al Qaeda’s allegiance to Mansour as a straightforward progression. There were indications prior to today that al Qaeda would remain loyal to the Taliban’s new leadership. Zawahiri includes the same line in his speech. And he makes it clear that al Qaeda will continue to fight side-by-side with the Taliban even though both Mullah Omar and Osama bin Laden are now gone. Can we expect now a formal and explicit oath of allegiance to Mollah Mansur by AQAP, AQIM, AQWA and Jabhat al-Nusra ? No, it is implicit through Zawahiri’s oath. They all swear allegiance to Zawahiri, Zawahiri swears to Mansour. I am not that sure that such an indirect oath means they do recognize any authority to Mansour as they do that Zawahiri, even of course if Zawahiri’s authority is more virtual than effective on their respective fronts. Very careful (and confident) language. Doesn’t want to start a jihadi civil war b4 the world sees what he’s been working on. Then the chips can fall. Following the Mullah Omar-ISI asset ruse, the US should be redefining its relations with Pakistan (think reverse of post-Davis), but is it? Hell no, we’re still looking for people (Taliban) to surrender to so we can leave with “dignity”. We need a proper retrograde BACK to AFG. There is much work left to do. Lots happening in Greater Jihadiland: Kabul going boom, IS deploying WMD, Hamza BL back, MBM goes AQ, and what is the deal w Shekau? I wonder if this is an act of desperation as AQ depends on the Taliban to harbor them. One can only hope that the whole organization is soon to crumble with Omar’s death. Arjuna, I agree he is definitely showing his age! Anyone else think it’s notable that Zawahiri apparently has his Isiri-assisted Khorasan “Group” (AQAP’s “travel team”) focusing on airliner suicide attacks where the wreckage falls on Washington, Paris and London as an homage to Osama and now simultaneously with Z’s first release in almost a year the long-lost, favorite son Hamza surfaces (from NWFP by way of Iran?) calling for attacks against… Washington, Paris and London?